Previously we looked at the Line Break chart which was great for spotting possible reversals. In this article, we look at an approach that can filter out some of the psychological issues you may be having with your analysis. 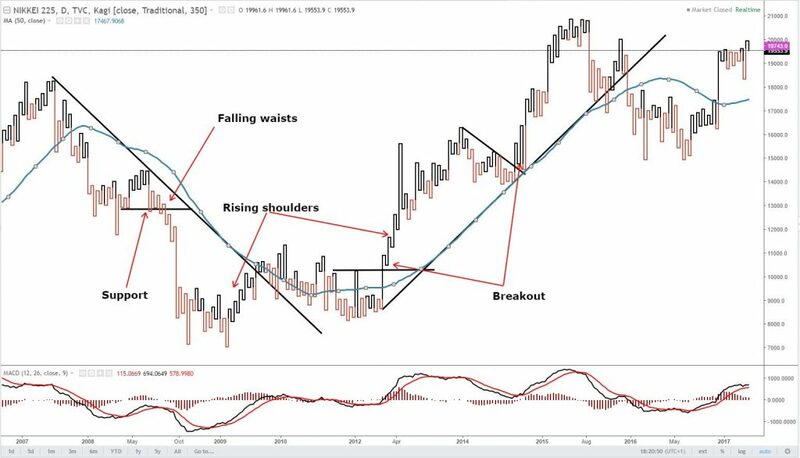 If you’re struggling with the ‘noise’ of the charts and information overload in your trading, then Kagi charting could be just the thing for you to add to your trading arsenal. Kagi charts were developed in Japan in the 1870’s when their stock market started trading and were used to track the price movement of rice. They were used to give a much more transparent picture of where the price of an individual asset was headed independent of time. Due to the global world we live in and the advancement in charting software, techniques such as Kagi charting are now available to all of us. 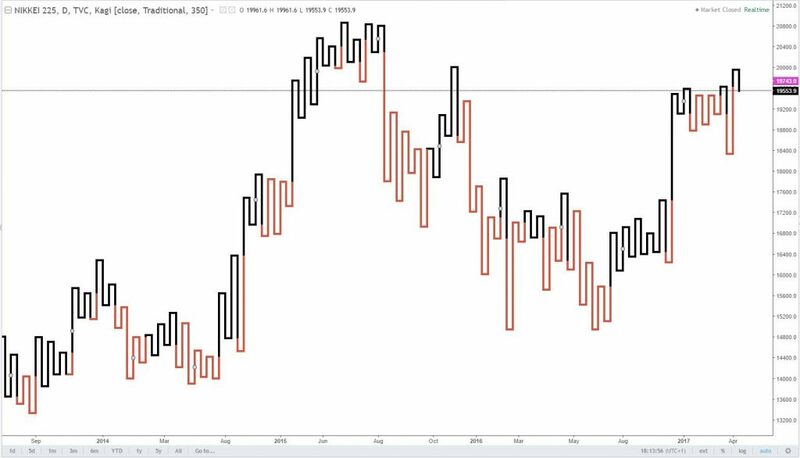 It’s all about the Yin and Yang: What are Kagi charts? 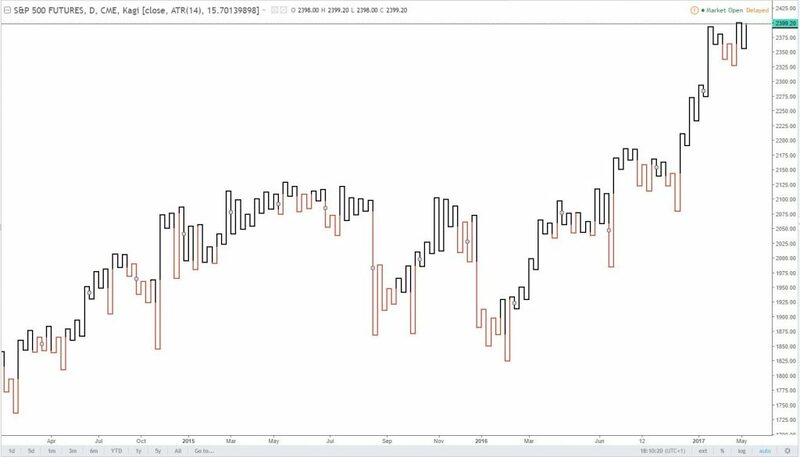 Kagi charts, like their western equivalent the ‘point and figure chart’, do away with time, leaving the user to focus only on the price action. Instead of using ‘X’s and O’s like point and figure charts, the Kagi chart simply uses lines. These lines are known as the Yin and Yang lines. The other fundamental concept of these charts, is that of the reversal in price. The lines change direction once the price moves a set amount. This calculation is not restricted to just the ‘close’, but could also be based on a range such as the high-low. The reversal amount is the minimum price change required for the Kagi line to reverse its direction. If a reversal were to occur, a horizontal line would be drawn and a new vertical line up would be added. 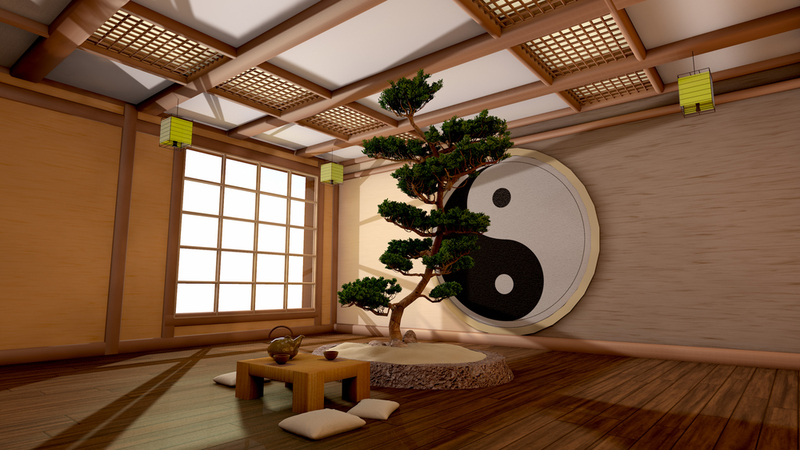 The most simple strategy is to buy on a new Yang line and sell on a new Yin line. This basic concept can be further enhanced by analysing the patterns of the lines. A lot of traditional pattern analysis can be applied to these charts e.g. 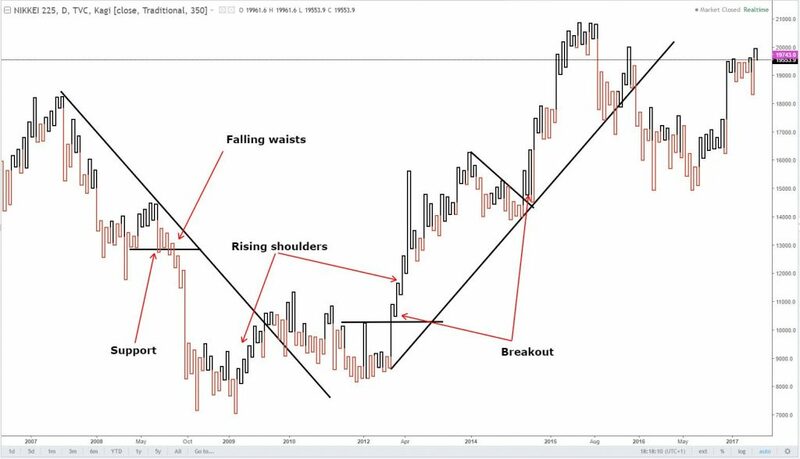 breakouts, trend line breaks and also add their own unique set of named patterns such as the Buddha (essentially a head and shoulders pattern), falling waists, rising shoulders etc. You don’t have to stop at just pattern analysis though. 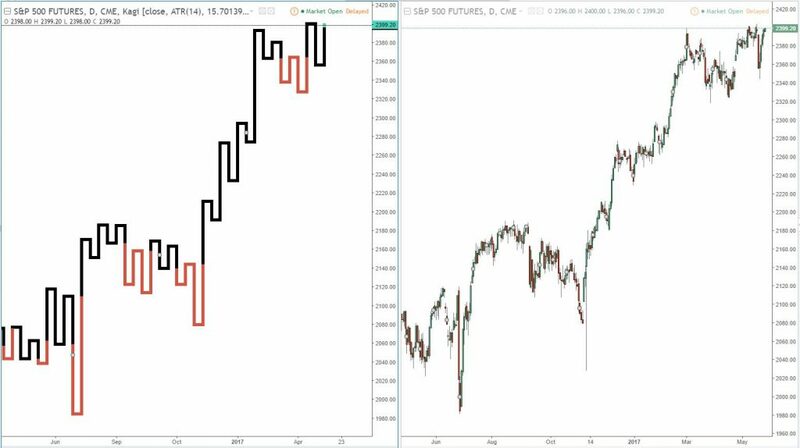 Advancements in charting software mean you can also add indicators to your analysis which, with a bit of planning, could create some fabulous trading strategies. Why not consider: RSI, MACD, Stochastics, Moving Averages etc to determine support, resistance, entry and exit points. Kagi charting is an ancient method brought to life today, through the enhancement and development of technical analysis charting software. These charts offer a very different perspective on trading. A perspective that is devoid of noise and made simple, so that the user can clearly see key support and resistance levels, breakouts in the price, chart pattern formation and trends, as well as being able to add indicators on top of the analysis to create trading strategies. What’s not to like about Kagi charting? !